Let’s Discuss!!! Soco or Ye! – Which Is Your Song Of The Year? The battle for the song of the Year has been going on for sometimes now. While sections of the media are split in their decision to choose which song banged hard this year. The fans too. Opinions are divided, everyone argues one song is better than the other and everyone does not come to a consensus and agree on a unified decision which song did well. There were several hit songs this year though. We had Fake Love, Nowo, Baba, Assurance, Mind, Soco, Ye, Nwa Baby and several others. However, the two biggest songs this year happen to be Wizkid’s Soco and Burna Boy’s Ye. It’s a sharp contrast when we had Davido’s If as 2017’s song of the Year. We all agreed on that and he deserved that. But it’s 2018 and everyone’s opinion is divided. Soco was all about vibe music. WizKid wanted everyone to dance. Forget your misery and soak your body in that dance. READ ALSO:- Peruzzi vs Teniola! Who Do You Think Deserve The Headies Next Rated Award? Once the DJ plays Soco, anywhere you are, whatever you are doing, it ushers you into that dance consciousness. It’s that song that makes you lose your home training, that’s if you’ve got one. But Ye had this thinking factor. Burna Boy wanted his fans to think of all the suffering we go through everyday especially in a poverty stricken country. So he made “Ye“, so as we continue to suffer, we chant Ye, Ye, Ye. While Ye thrived on Kanye West‘s Ye album to further blow up, it’s so amazing to see Soco still trending till the end of the year. But still we can’t decide for everyone. Even among these artistes, there’s a wide disparity on which song is the best of the year. 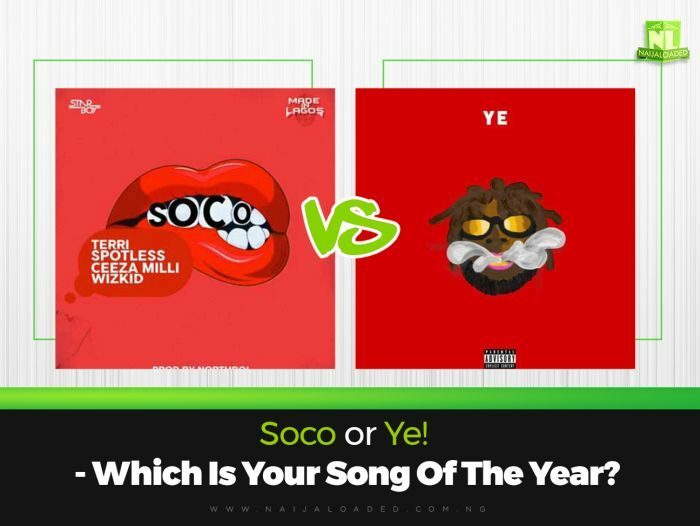 Soco or Ye! – Which Is Your Song Of The Year?